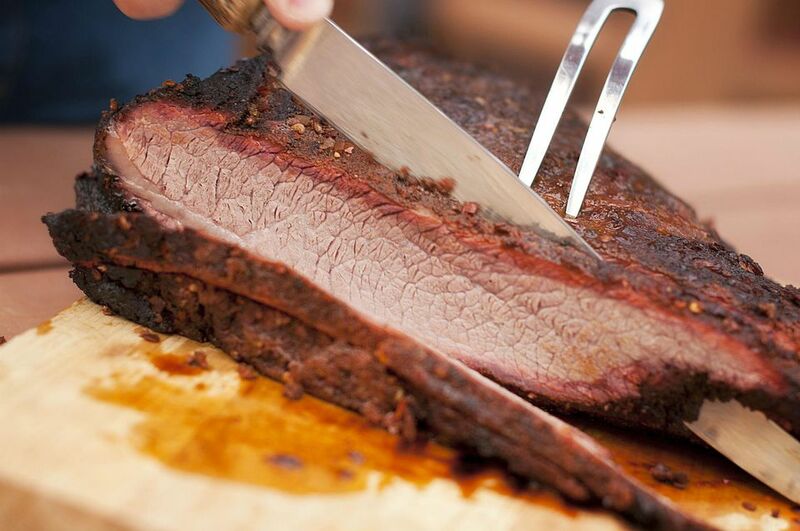 We know, you're not supposed to smoke a trimmed brisket. However, the marinade in this recipe really helps to keep the brisket tender and moist. This is a great recipe for those who want a small brisket or those that can't find an untrimmed brisket. Place brisket flat in a shallow pan. Combine other ingredients and pour over brisket. Cover and refrigerate for 24 hours (turning occasionally). Remove from refrigerator and allow to reach room temperature. You will want to smoke for about 4-5 hours at 220-240 F/105-115 C.
If you are using a water smoker, you can put the remaining marinade in the water pan to add flavor. Place brisket on the smoker and cook until the internal temperature reaches 180 F/80 C.
Remove and slice across the grain.